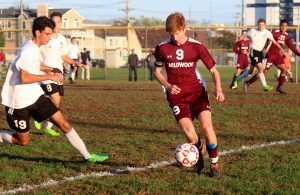 Two boys soccer players from Wildwood High School and one from Ocean City have received major statewide accolades. 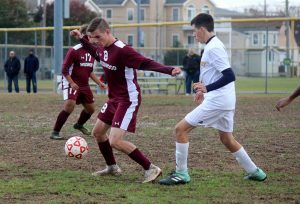 Senior forward Tyler Tomlin and junior defender Corlen Vallese of Wildwood and senior midfielder Matt Brook of Ocean City have each been named state group all-stars by the Soccer Coaches Association of New Jersey. Tomlin and Vallese are Group I selections; Brook is a Group III pick. The trio will be honored, along with the rest of the SCANJ all-stars, at a banquet on Jan. 6 in Edison. Tomlin led Cape May County and was among the leaders in South Jersey in goals scored with 31. He also added 10 assists. His season goal total and career goal total of 57 set new Wildwood boys soccer records. Vallese played a vital role for the Warriors as the team’s center back. He provided a steadying influence on an otherwise inexperienced back line. Vallese also added one goal. Tomlin and Vallese led Wildwood to a 13-6 finish in 2018. The 13 wins were a program record. The Warriors also hosted a state tournament game for the first time. Brook was one of the main catalysts for an Ocean City team that finished 15-5-1, won the Cape-Atlantic National Conference title and was the champion of the inaugural CAL playoff tournament. Brook scored seven goals and tied for the team lead in assists with nine for the Raiders, who won a first-round state playoff game before losing in penalty kicks to Cherry Hill West after a 1-1 draw in the quarterfinal round of the South Jersey Group III Tournament. Brook and Tomlin also each participated in the South Jersey Soccer Coaches Association senior all-star game earlier this month.